The good news is that the employment rate has grown to 71.7 per cent (all aged 16-64) in June-August 2013, up from 70.7 per cent when the coalition government took office. There are almost 700,000 more people in work. However, there are several reasons to doubt the notion that the employment rate heralds sustainable economic recovery. Firstly, the biggest leap in employment during this period actually came between the middle of 2011 and the middle of 2012 (when around 500,000 people found work, and the 16-64 rate rose from 70.3 to 71.4 per cent). This is when economic growth was still flatlining – so the recent recovery in overall growth is actually associated with a slowdown in job creation, not an acceleration. Secondly, the headline employment rate hides a very worrying trend of under-employment. 26.9 per cent of people (more than 8 million people) in employment are part-time workers. 18.5 per cent of these (almost 1.5 million people) report working part-time because they could not find a full-time job. This rate has been rising, rather than falling, during the 2013 recovery. The rate was only 14.3 per cent when the coalition took office. It was below 10 per cent at the height of the boom, and had been at this level since the end of 2000. A related trend is the resurgence in temporary employment. More than 1.5 million people are temporary employees (6.2 per cent of those in employment); 38.9 per cent because they could not find a permanent job. This rate has been falling slightly since the middle of 2012, but has risen from 36.3 per cent when the coalition took office. The rate was around 27 per cent throughout 2007, although had been higher than 40 per cent throughout much of the 1990s. Much of this temporary employment is composed of workers on ‘zero hours’ contracts –exposed on this blog recently by Scott Lavery. Thirdly, while the unemployment rate has been falling fairly steadily from late 2011, the number of people in long-term unemployment has been fairly static, and in fact risen since early 2012. Fourthly, the age distribution of employment results shows some worrying trends. Of the 741,000 people of all ages that have entered employment in the last three years, 163,000 of them (more than a fifth) have been aged 65 or over. In contrast, there are 149,000 fewer 18-24 year-olds in employment, and 33,000 more unemployed. The employment level of 18-24 year-olds has fallen consistently since late 2012, even as the overall economy returned to growth. Fifthly, employment growth has actually been concentrated among ‘foreign’ workers. Of the 300,000 people that entered employment in the year to April-June 2013 (the latest figures available at the time of writing), almost a third were non-UK nationals. Remarkably, more than two-thirds were not born in the UK. These results demonstrate the growth of low-paid work as the bulwark of the positive employment news – the kind of employment opportunities that tend to be associated with immigration, whether recent or historical. The alarming trend in pay is the sixth reason to question the ‘good news’ on employment. 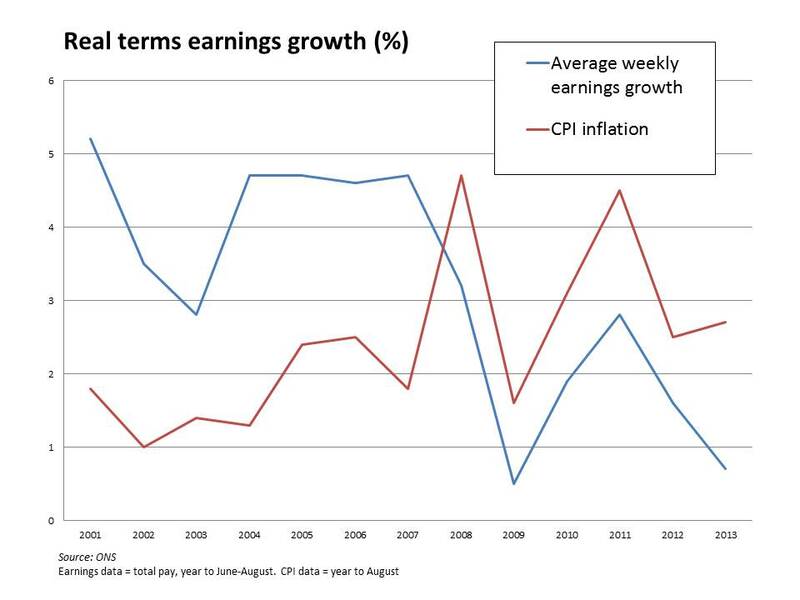 Pay has fallen in real terms every year since 2008, and the gap between pay and inflation has widened since the coalition government took office. As Lavery points out, low pay and precarious employment go hand-in-hand, with workers on zero hour contracts paid on average half as much as those employed on standard terms. The fact that pay is falling while employment rises points to the seventh reason not to be cheerful: productivity in the UK is stagnant. Output per hour has yet to recover the ground lost since the coalition government came to office, and remains below the level recorded in 2006. Under-investment in skills and technology means that increases in labour inputs are outpacing increases in output. This equates to more jobs, but also worse jobs, and does not represent a sustainable path to employment growth. And finally, while employment has gone up, increases have been concentrated in London and the South East. In the year to June-August 2013, the employment rate fell by 1.4 per cent in the North East, 1.6 per cent in the North West, 0.8 per cent in the West Midlands and 0.3 per cent in the East Midlands, and was stagnant in Wales. It rose by 1 per cent in both London and the East of England, and 1.8 per cent in the South East. London’s booming property market is clearly part of the explanation here, as almost a quarter of new jobs created have in the past year have been in ‘real estate activities’ – an incredible 16 per cent annual growth rate for this sector. In contrast, there were 15,000 fewer jobs in manufacturing, representing a decline of 0.6 per cent. There is a similar story regarding pay trends regionally. Across Northern England, the pay levels are roughly the same proportion below the national average that they were before the recession. Yet pay in London has accelerated: in June 2003, pay in London was 25 per cent above the UK average; by 2008 it was 31 per cent above; by June 2013, London pay was 33 per cent above the UK average. Employment, like overall growth, seems to be going in the right direction. But only on the crudest possible interpretation of the data can the employment news be considered a signal of a healthy economy.